It’s time to search & destroy all at mach speed one more time! Kamen Rider Drive continues to be a merchandising juggernaut with new releases churned out from Bandai every quarter. Even now, nearly 3 years after the series finale. This go around we’re looking at the first new S.H. Figuart released from the series second V-Cinema, Drive Saga: Kamen Rider Mach/Kamen Rider Heart. Once again Bandai has managed to fashion a new form out of pre-existing molds to create S.H. Figuarts Kamen Rider Mach Chaser! Not to be confused with last years’ Kamen Rider Chaser Mach, Mach Chaser is Gou’s final form. Accessed through a new Shift Ride Crosser (which is present in the Mach Driver), Mach Chaser is a new spin on what made Chaser Mach so great. This time the cohesion between the mishmash of Mach & Chaser parts is even greater though thanks to a solid new color scheme. As always Gou has his trusty Zenrin Shooter at his side, and this time he has the addition of a brand new zenrin effect part for curved slashes! If you loved Chaser Mach then there’s lots to love for you here with Mach Chaser as well. Drive as a franchise has been built on smart repaints and reuses of pre-existing designs, this is yet another wonderful execution of that ideology. And just a heads up, Mach Chaser does not come with a Signal Ax, the ones in these shots came from my Kamen Rider Chaser. We’ve attached a selection of images to this post but you can view the full 80 image gallery by clicking “Discuss on the TokuNation Forums” at the bottom of this post. We’ll be back in the VERY near future with a pair of new galleries from Kamen Rider W & Space Sheriff Gavan! Kamen Rider Drive has been enjoying quite the second life in the form of various movie appearances & special V-Cinema releases. And luckily so have his allies. Chase had his own in the form of the Kamen Rider Drive Saga: Kamen Rider Chaser film. This direct to video film also featured a brand new form for Chaser, an upgrade of his Roidmude reaper form, which we’re focusing on for today’s gallery. S.H. Figuarts Super Mashin Chaser! Super Mashin Chaser is actually the 3rd outing so far of the Chaser mold. Following up from Mashin Chaser & Super Dead Heat Drive. But that hasn’t diminished how impressive it is each time eather. This mold still rocks some gorgeous asymmetry, only this time in impressive gold! There’s not much new to say about how the figure is designed, but it does have a striking color scheme. And while it’s lite on accessories outside the new Break Gunner Super Viral Core Loaded Version, it’s still compatible with the previously released Tune/Busou Chaser accessory set! So there’s plenty of play value in this gorgeous figure. We’ve assembled a full 80 images of this figure for your viewing pleasure. Just click “Discuss on the TokuNation Forums” to see the full gallery & review. We’ll see you soon with a couple of new throwback galleries from Kamen Rider’s W & Kabuto! It’s the middle of the month which means it’s time for a fresh batch of official images from Tamashii Nations! Tonight kicks off with official images & release info for the upcoming S.I.C. Mashin Chaser! S.I.C. Mashin Chaser was first revealed at Tamashii Nations 2016 in October. Since then we’ve wondered when this beauty would be released, thankfully we can look forward to it now in May 2017. This gorgeous figure is loaded down with accessories as well, including 2 sets of hands, all 3 Viral Cores, the Break Gunner, & the Busou Chaser parts! S.I.C. Mashin Chaser will be released as Tamashii Web Exclusive for 9180 yen. › Companies: Tamashii Nations, Bandai Japan › Characters: Kamen Rider Chaser, Mashin Chaser, Kamen Rider Proto Drive › Toyline: S.I.C. Confirmed for release earlier today, we now have a full selection of official images for the upcoming S.H. Figuarts Chou (Super) Mashin Chaser! Chou Mashin Chaser is set for release as a Tamashii Web Exclusive in February 2017 for 5940 yen. This unique repaint of the original release is now the 3rd use of this mold following Mashin Chaser & Super Dead Heat Drive releases. He includes 3 sets of additional hands, the Rhino Super Viral Core, and the Break Gunner Super Viral Core Loaded version. Be sure to get in touch with your preferred middleman or Tamashii Web Exclusive service when orders open to secure one. You can find a list of some such sites here. It’s a pretty good month for fans of Kamen Rider Drive. The latest reveal for the franchise comes straight out of the Mashin Chaser V-Cinema with S.H. Figuarts Chou Mashin Chaser! Accessed using the Rhino Super Viral Core, this form is seen only in the above mentioned V-Cinema and many doubted it would ever see release. But color us pleasantly surprised by this reveal. S.H. 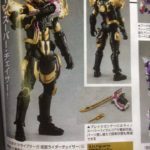 Figaurts Chou Mashin Chaser will be released in February 2017 as a Tamashii Web Exclusive. Retail price is 5940 yen. From Kamen Riders Kabuto, Ghost, & Drive, with a little hint of something off-beat, we wanted to bring you a warm up round of galleries to prep things for the coming months. We’ve attached one image from each of these galleries to this post, but follow all of the links above to be taken to each of these extensive photo shoots in their entirety. Beginning in July TokuNation.com’s Photo & Content staff will be working harder than ever to bring you what you want. Be sure to stay tuned! “You used me, you brought shame on my sister, you used Krim’s inventions for Evil! But, worse than any of that, you….. The rage and conviction of Machs’ loss is embodied in this final last ditch form used to defeat his father, Gold Drive. Though a last minute addition to the series, Kamen Rider Chaser Mach manages to debut in one of the most heartbreaking and powerful scenes in Kamen Rider Drive. S.H. Figuarts Kamen Rider Chaser Mach is pretty much like it’s show counterpart. A combination of various parts from the two figures that preceded it, Chaser & Mach. But surprisingly it doesn’t feel tired or boring even if I’ve technicality handled this figure several times before. Chaser Mach seamlessly integrates the components of these two riders into one fantastic form that feels just right. Throw in a cople signature weapons like the Zenrin Shooter & Signal Ax and you’ve one pretty darn solid release. Now if only S.H. Figuarts Gold Drive were out already, this gallery needs a deadbeat dad…. We’ve attached a selection of images to this post but please enjoy 75 images after the jump by clicking “discuss on the TokuNation forums” at the bottom of this post. We’ll be back soon with several more galleries! It’s time for another sponsor update from BigBadToyStore.com – your #1 source for all your toku toys! Check out all their current pre-orders and new arrivals, toku-themed, listed below! New Arrivals and In-Stock Items! Don’t forget to check out the elusive “Pile of Loot” shipping method where you can order tons of toys, store them in your own personal warehouse, and then ship them altogether – saving you HUNDREDS of dollars! For the best customer service around, visit BigBadToyStore.com today! Check out the full newsletter by clicking “Read More” below! Another month has come & gone and so we have a number of toy galleries and in depth reviews by our Photo & Content staff to round-up once again! We plumed the depths of time to bring you an incredibly special gallery from Power Rangers Lost Galaxy, we made a couple of pit stops with Kamen Rider Drive, recharged with some Dino Supercharge figures, and went a little western with Shuriken Sentai Ninninger! As always you’ll find below links to this months gallery/reviews. We look forward to bringing you even more content this month! Our site sponsor BigBadToyStore.com has sent a new update regarding some items now available for pre-order and other items that are now in stock! Check out all the new pre-orders as well as the new arrivals (including some popular Legacy items) below! Be sure to check out the amazing Pile of Loot feature – where you can combine multiple orders in to one shipment and save potentially hundreds of dollars in shipping costs! For the best customer service around, check out the leader in online toy and collectible sales – BigBadToyStore.com! Check out the latest newsletter in its entirety by clicking “Read More”! All times are GMT -4. The time now is 4:44 PM.